Rustic bread, granary or with walnuts, honey, dried fruit and jam… Find out how to reinvent the humble cheeseboard! 1) The cheese: We recommend you remove your Petit Camembert ILE DE FRANCE® from the fridge 30 minutes before serving to maximise its creaminess and gourmet flavour. 2) Bread choice: You can use several different breads such as walnut bread, rustic or granary. Cut slices and toast in the oven. 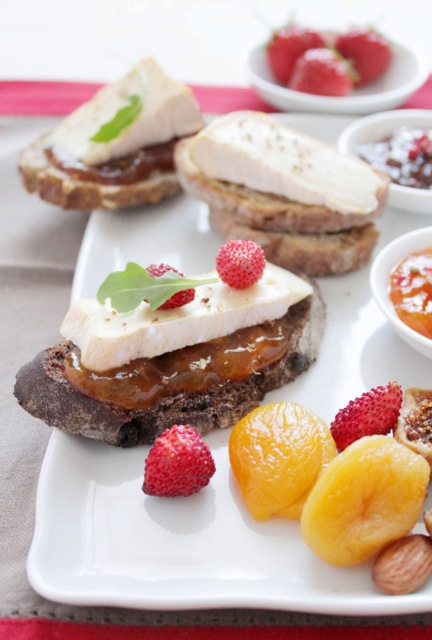 3) Accompaniments: We recommend several flavours of jam: such as apricot and fig. Raisins, dried figs, dried apricots and walnuts.